I take my hat off to retailers around the globe, for theirs is no easy task. In just a couple of sentences they will often try to ascertain which type of fishkeeper you are, and cater to you accordingly. And I have to concede, most of them get it right in next to no time, sizing up your experience, technical expertise and limitations in just a few moments, making sure that they don’t talk too technically, or patronise. Aquarists, you are such a rich mosaic of stereotypes. I’ve only met some of you, and I’m sure there are still so many more to come to know. A commonly found variant of new aquarist, you’ll be recognised by an almost obsessive adherence to any advice given. New to the game, you’ll be on your first tank, stepping tentatively into a world of bacteria and water chemistry to which you’d been previously unaware. You take things literally, ensuring that when you do a 25% water change it is exactly that – maybe even resorting to a measuring tape down the side of the tank so that you only take exactly 25% and not a drop more. A reading of 0.1 of nitrite on a test kit might set you up for a week’s worth of palpitations, and you spend the nighttime listening intently for the sound of a fish jumping out, or a pump failing. Similar to the bushy tailed aquarist, you’ll give yourself away by a 'chocs away!' attitude that sees you making lots of errors on a sharp learning curve of fishkeeping. Literally chomping at the bit, you’re eager to get your next fish asap. You’ll take samples of water in stores to be tested, and race off into the fish house while you await the results. You like to do things your own way, choosing not to leave it for the extra week that the retailer recommended, and you knee jerk at the first sign of trouble. A single bubble caught in the mucous of a fish is enough to see you reaching for a tanker’s worth of white spot treatment. You’ve done the standard community, and it’s gotten dull as dishwater. You crave spice, variety and something left of centre. Your tank is characterised by having no geographical consistency at all. Ancistrus bump noses with blockheads, while a couple of hatchetfish get confused by the bluster of a passing Kuhlii loach. And you love it! Often you’ll have a ‘books know nothing’ attitude. Of course Sucking loach are fine, they’ve never bothered the Silver dollars you have in their lives, and that African butterfly fish – the literature said it was a jumper, but it’s been sat in an open topped tank for months without even a hint of taking a leap. Sub species of the pick ‘n’ mixer include the goldfish/Paradise fish/danio club, and the often healthier alternative, the genus blender. Genus blenders tend to mix things up, but only within a couple of small groups – say 50 different species of Corydoras roaming the base of the tank in a rag tag but happy shoal. You’ll be carrying a few scars by now, having grappled fish both big and small from your fishkeeping experiences. You’ll likely have a year or more under the belt, and you fancy a stab at more serious fishkeeping. African keepers are found in this species, as are tankbuster keepers, and fledgling catfish keepers. You’ll have a good idea of a generic region for your fish, although you may have a dash of pick 'n' mixer in the blood, pushing in supplementary plants or the odd extra species that doesn’t sit too well. You’ll try hard, and get good results from your displays. 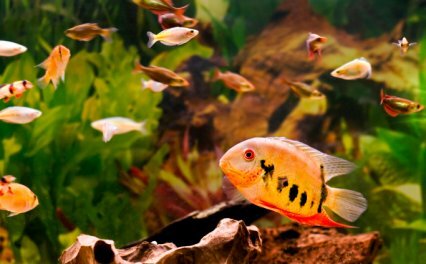 You’ll be happy to show them off, attracting the attention of non-fishkeepers with your infectious enthusiasm for the subject. By now you’ll be talking with a little authority and will be in a comfortable position to speak at length and with clarity about your special subject. You saw your first Amano style tank – or more often an image of an actual Amano tank – and your life changed. You sold the car, invested in expensive glass, learnt everything there was to possibly know about CO2, and now have a glowing garden of lush greenery, which despite its perfection you never really feel happy with. You fight the urge to trim plants constantly, and the first sign of algae on a leaf makes you want to tear your world apart and start again, but you persevere, locked in the obsessive compulsion of planted 'scapes that outsiders never really fully understand – irrespective of how much they adore the results. You’ve found yourself somewhere beyond the usual biotope attempt. Now you strive for perfection. You download papers from scientists about specific regions of rivers in the Amazon, and you scour the earth for the exact species of plant and fish found there. Chances are that the region you’re focused on is so obscure and remote that your efforts are largely in vain. But given the chance, you’d be importing leaf litter and the exact species of food copepod from the 90cm/36" stretch of stream you’re emulating, if you could. A variant of the purist is the wobbler. The wobbler is a frustrated purist who has reached the point of understanding that the more they know of their given biotope, the less likely they are to ever properly recreate it. Sometimes, a confusing hobby period follows, where the aquarist plods on, a little empty and looking for the next big thing. You’re a gadgetry wizard. If it flashes, beeps, changes flows, or does something remotely then you’re all over it. Your tank may not be too big, with some techies favouring the tiniest of nano tanks, but it will be more drizzled in sci-fi gear than the entire series of Star Trek. In fact, you’ll probably have a crazed ratio of something like £500 hardware per 1” of fish, such is the techophilia in your blood. You’ll be able to pilot your tank from the moon if you so wished, with everything rigged in to devices that make it possible for you to change your lighting spectrum by 1K at a time should you want to, and all from the comfort of your iPhone. You now have many, many moons of fishkeeping under your wing. Other aquarists look up to you as a village elder, and your knowledge of the subject is pretty unrivalled. You’ve seen equipment come and go, you’ve bred numerous species and developed your own techniques for rearing fry and treating illnesses. You have an almost sixth sense for the presence of ammonia or nitrite, and a passing glance at the tank will tell you whether you need to get the test kit back out. You can spot a single ichthyopthirius parasite from 50 yards, and rarely need to resort to medications. Although you may have had a fish house previously, chances are that you’ve only got one or two tanks now, having overcome the urge to collect all and sundry. Most importantly of all, you are very aware that you don’t know everything about fishkeeping, and have intelligent input to offer to any new method or fishkeeping equipment that appears. You’ve kept fish since before everyone else was born and you’ve learnt absolutely nothing along the way. You still refuse to touch dechlorinator, thinking it an expensive gimmick. There’s nothing that anyone, anywhere can tell you about keeping fish, and if they try then you’ll just talk over them. Chances are that many fish have died at your hand, and the remaining ones sit pickling in tanks powered by undergravels and silt, their cells gradually degrading through the lifelong onslaught of nitrate and phosphate. A single bucket of water from any of your set ups could likely maintain a medium scale farm in Norfolk. A variant of an old pro [good], but attainable much earlier in the fishkeeping hobby. A full circle aquarist has done a little of everything and come out the other side wiser and more aware for the experience. To you, a novelty fish is just that – a novelty. You’re aware of your limitations, and you’ve now had a play with enough species to form an opinion on a large chunk of the hobby. But you’ve found total peace with yourself. No longer do you strive for gigantic puffers, or fang-toothed predators. Garish colours tire you out, and fish that spend 99% of their lives hiding are fascinating, but not worth staying up for all night for a chance glimpse. Chances are that you’ve reverted to a simple way of fishkeeping. You’ve trimmed off the fat and although you have a more than adequate set up for your fish, there’s nothing ostentatious or unnecessary on your aquarium. It’s likely that by now you’ve got a beautiful shoal of Cardinals and maybe a couple of Angelfish, and very little else. That’s a taster of some of the fishkeeping examples I’ve met over the years. For myself, I’d probably put myself down as something of a wobbler, with a dash of novice aquascaper, and hoping for my first sniff of full circle anytime soon. I know there are many more than the above, so feel free to share with me your own, stereotypical aquarists. I’d love to hear them.